Next week, sportswear giant Nike will throw open the doors to an exhibition titled The Nature of Motion, which will be staged as part of Milano Design Week 2016 in Milan. Partnering with ten contemporary designers (who range from furniture designers to architects), the exhibition will feature a “series of experiments in natural motion that explore the future potential of footwear design” created by Nike’s team. For this show, each designer was given a pair of Nike Flyknit Superfly trainers to play around with. 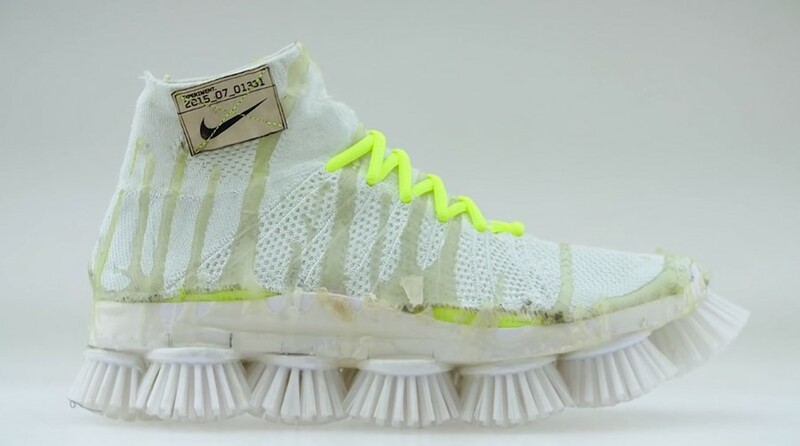 They were asked to explore the sensation of running, and so created shoes fitted with soles constructed from a variety of objects including hair rollers, dish brushes and small stones. Some designs allow the wearers to bounce up and down, while others emulate the feeling of hovering above the ground. The show will also coincide with the launch of the brand’s latest show, NikeLab Free RN Motion Flyknit. The Nature of Motion exhibition will be open from April 12-17 in Milan.